If you live anywhere near Wichita Falls, TX, tune into 106.3 FM the Buzz this Thursday at 4 p.m. We'll be on with DJ Vicki Vox playing a couple of new tunes and generally making your drive-time brighter. You might be able to listen in at www.1063thebuzz.com as well. And if you live anywhere near Oklahoma City, we had such a good time playing there last weekend, that we're rocking again this weekend! We go in next month to begin recording the follow-up to Listen. We'll be recording at Reeltime Audio in Denton, TX with Eric Delegaard. Eric is a great producer, and has worked with Upside, Bowling for Soup, Edgewater, and Jibe, among others. We'll let you know when you can start hearing the results! That doesn't mean we're done with Listen, however. It looks like one of the tracks off the album will be on a compilation CD released by our pals at Budweiser this fall. We'll let you know details when we get 'em. 10 p.m. Make sure you tell 'em 12 Pearls sent ya at the door! Our song "Raining," off of the Listen EP, has just been added in rotation on Shonan Beach FM 78.9 in Chiba, JAPAN! You can listen for yourself on their webcast at www.beachfm.co.jp . Domo arigato! On the other side of the world, tracks from both of our albums are now available for purchase on the new British, French, and German iTunes. They're just 79 pence in Britain and 0.99 euros in France and Germany. And here in America, we just got invited to showcase at the Midpoint Music Festival in Cincinnati, Ohio. The festival takes place from Sept. 22-25 all over Cincinnati, so once we find out when and where we're playing, we'll let you know! Ponca City is JUST a short 90-minute drive from OKC or 45 minutes from Stillwater (and 45 minutes from Wichita, too! ), so won't you come join us? If you do, and you come by the merch booth, we'll give you a t-shirt. No foolin'. In other news, expect new stickers very, very soon. And some new recordings? Could be... watch this space for announcements. Congratulations to Andy and Elizabeth Beck, who were wed Saturday, May 29 in Norman. Kit was best man. In 12p news, we're getting ready to go back into the studio for some more recording. When, where, and with who? Check this space in the next few weeks to find out! On Thursday, May 27, 12 Pearls will be making an appearance in the Indie Radio Live chat room from 3-5 p.m. CST. If you've ever wanted to participate in a live online chat with the band, now's your chance! Find out more at www.indieradiolive.com , and while you're there, request some 12p. hacked anymore. We appreciated the concerned e-mails, though. Also, due to circumstances beyond our control, our May 21 show was cancelled. Sorry to all our Norman fans; we'll try to make it up to you sometime this summer. We are still playing May 22 at the Moon in Fort Worth, TX with our good buddy Taylor Davis. See you there! If you live in Norman, tune in to the WIRE, OU's cable radio station, from 11 a.m. to 1 p.m. this Thursday (April 22). If you don't live in Norman you can listen live online at www.wire48.ou.edu. Brandon will be in-studio with DJ Katie to chat about the band and play some new tunes. our old buddy Taylor Davis coming up from Austin to open. there's going to be a freaking carnival across the street from the venue. Come rock out with the Feds, go ride the Ferris Wheel, check out some 12 Pearls, go do the Tilt-a-Whirl, come back for some Upside. What's better than that? Hide the kids and pack up the cats, 'cause Twelve Pearls has entered the 21st century! That's right, kids, we're digital now. Tracks from both our albums are now available to legally download on several services, including Itunes, Rhapsody, Napster, BuyMusic, MusicMatch, and Audio Lunchbox. If you subscribe to one of these services, just type in 12 Pearls and let the music come to you! Wth three months and ninety-one cds behind them, Andrew and Matt are still going strong. Their CD-A-Day project has proven itself quite interesting thus far. Andrew has been on a musical international voyage. Matt has been tying up loose ends, and listening to scary amounts of Van Halen. Keep tabs on all the music-geek action at http://cdaday.blogspot.com/. We'll try to get some copies to have at shows for those of you who want one. There was also a feature on us in a recent issue of Tsa La Gi, a magazine at Northeastern Oklahoma State. We were extremely saddened to hear of the death of Curt Martin, lead singer of 3 Strange Days, over the weekend. 3 Strange Days were the Tulsa Budweiser True Music band, and they'd helped us out a lot in the last year. Curt died tragically Saturday evening in a traffic accident following a 3SD show; he had recently found out that he was going to be a father. Our show Friday (March 5) at Brother's in Norman will be a benefit for Curt's family. We hope you guys can make it out. If you can't, we'll have a donation jar at our show Saturday at the Bricktown Brewery as well. 12 Pearls was recently named 2004 Oklahoma Rock Band of the Year by Payne County Line. Check it out at www.paynecountyline.com. Our second annual Mardi Gras party is going down this month at two locations. On Feb. 13, we'll be tossing beads at Willie's in Stillwater, and on Feb. 21, we'll be letting the good times roll at the new Wormy Dog Saloon in Bricktown, OKC, with The Great Divide. Hope you guys can make it out! Mention you read this for extra beads and Mardi Gras masks. Beginning today (January 1), Matt and our manager Andrew will be celebrating 2004 by listening to a different CD each day in a musical effort to see who can outlast the other (no CD can be played twice). You can follow along with what's on the playlist at www.cdaday.blogspot.com. We hope everyone had a happy holidays. Ours were nice and relaxing, but we're gearing up for an exciting 2004. Matt and Kit are rooting on the OSU Cowboys on Friday at the Cotton Bowl, and the whole band is gearing up for shows in Stillwater and Oklahoma City this month. We hope you guys can make it out. the featured band. Red Bud is planning to bring some big concerts to Stillwater this summer, so keep an eye on them. Finally, all you twelve pearls fans who don't live in OKC can now hear the Budweiser/twelve pearls radio spot! Just click here and enjoy! We would like to thank all of you who voted for us in the OklahomaRock.com awards. It doesn't look like we won (we came in 2nd), but you all did a wonderful job in showing your support for twelve pearls by getting out and voting. Thank You all. 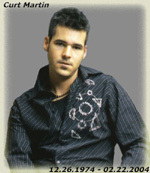 Visit www.paynecountyline.com for a new interview with Brandon by Stan Moffatt of Payne County Line productions. B waxes poetic on Oklahoma music, his memories of Stillwater's strip, and the best guitarist he's ever played with. 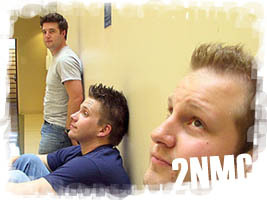 Please visit www.oklahomarock.com and vote for 12 Pearls in the 2003 Oklahoma Rock Awards. We're up for Best Rock/Pop act against Ester Drang, Falcon Five-O, Little League Hero, Shade Seven and the Stellas. Vote soon because it all ends Nov. 30. Speaking of Falcon Five-O, we're doing a show with them Saturday, Nov. 15 at the Bricktown Brewery in OKC. Last time, Brandon fell off the stage and Joe from FFO climbed up in the Brewery's rafters to sing a song. And it should be even MORE entertaining this time! Congratulations to Jordan and Kerensa Doolen, who were wed in late September in Jamaica and celebrated with a reception Saturday evening in Oklahoma City. Brandon joined Jordan and friends for a five-man acoustical jam to round out the evening's festivities. Well here it is. All you twelve pearls fans who don't live in OKC can now hear the Budweiser/twelve pearls radio spot! Just click here and enjoy! Also, 12 Pearls will be playing the Rocktober Fest at Northeastern Oklahoma State University in Tahlequah on Oct. 22 with Falcon Five-O and the Midwest Kings. The band will play from 6 to 6:45 p.m., and admission is free. And if you can't make it to that show, our own Brandon Jackson is now playing Monday nights with Steve Rice and Tuesday nights solo at the Wormy Dog Saloon in Stillwater. We heard if you yell for it long enough, he will eventually play "Free Bird." OK, we should let everybody know that Brandon is OK. In case you haven't heard or weren't there, B took a bit of a tumble off the Bricktown Brewery stage (a five-foot drop) Saturday night in OKC, but after laying on his back for a couple of minutes while we asked him concussion questions ("Where's the Super Bowl this year, Brandon?" "T. Boone Pickens Stadium?" "Ah, close enough"), he got back up and finished the set. We weren't able to get a picture of the fateful plunge, but we commissioned one of those courtroom sketch artists to draw a diagram (see above). The Nashville New Music Conference has selected twelve pearls to be one of the showcasing bands at this year's event! The band will showcase at "The End" in downtown Nashville Friday, Sept. 12, at 8:50. We look forward to seeing all you Nashville twelve pearls fans out at the show! Check out www.2nmc.com for more details! Tune in at 8pm this sunday night, august 17, as Twelve Pearls will be the special guest on Hot 93.7FM in Stillwater! We'll be doing a live interview, playing songs off the new ep, AND we'll be playing a few new songs live in studio! If you'd like to get a free copy of the new ep, just call in with a question and we'll be happy to chat with ya...and give you a cd. The number to call is: (405) 372-5774. Go ahead, give it a listen. thunderous bass, with Matt thrashing that beat on the drums. 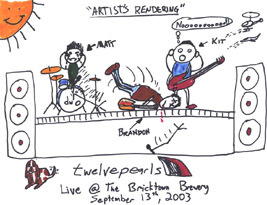 That's right, 12 Pearls will officially be a power trio for the time being (that's four pearls per member, kids)! Come join us for a farewell concert for Jordan at Willie's Saloon in Stillwater on Saturday, August 23. We hope to have a collection of friends in attendance to add to the show, so come check it out. budweiser.com. Also, keep your ears open for the 12 pearls/Budweiser radio spot soon to be on Oklahoma City radio.